The Crusaders have moved quickly to refute claims by Bulls captain Victor Matfield that they are guilty of illegal scrummaging ahead of their Super 14 semi-final showdown in Johannesburg on Saturday. Springboks lock Matfield, who will earn his 100th Super Rugby cap at the Soweto Stadium, sparked the war of words by accusing his side's New Zealand rivals of underhand tactics at the pivotal set-piece but Blackadder has shrugged off the claim, declaring, ""We have got a great scrum and have used it as a weapon all year. We refute those claims, we don't need to cheat." Matfield told South African rugby website keo.co.za, "They're a great scrummaging unit, but we've observed that they target the tighthead side of the scrum through illegal means. We'll ask the referee (Australian Stu Dickinson) to watch out for that. It's a small thing but could make a big difference in a semifinal." Matfield, a lineout maestro, said his forwards would have to brace themselves in other areas where he felt the Crusaders excelled in their previous meeting on May 8 at Loftus Versfeld in Pretoria when the Bulls escaped with a 40-35 win thanks only to a highly contentious late try. Speaking today from Pretoria before leaving for Johannesburg, Blackadder said he had no issues to raise with Dickinson about the Bulls in any pre-match chat. The seven-time champion Crusaders are not about to change their style too much for this game. "We believe we got a game that can adapt on the day," Blackadder said. "We can play a variety of tactics and believe we have got a good gameplan in place, we will not stray too far from what we have been doing." The forwards had worked hard on their lineouts all week, a key aspect to neutralising the power of the Bulls forwards. "Our lineout was poor three weeks ago, but we have made massive strides since," he said. "We attacked the Brumbies last week which is something we haven't done for a while. "The team have put in a lot of yards to get that part of the set pieces right. If we get the lineout right, we reap the benefit of scoring out wide. Our lineout is really strong, we know it's a strength of theirs and we got a good plan to negate it." 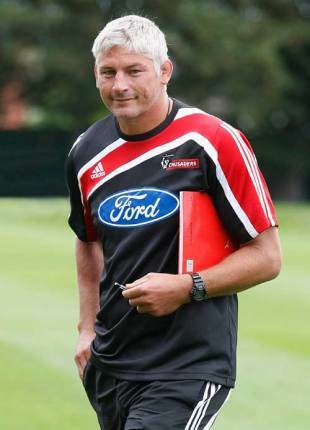 While the Crusaders boasted experience in the forwards led by skipper Richie McCaw and powered by the indomitable Brad Thorne, Blackadder felt young backs such as Daniel Bowden, Robert Fruean, Sean Maitland and Colin Slade were coming of age and would stand up to the pressure cooker atmosphere of a semi-final. "Even though they're young they have got good experience under their belts -- they went really well against the Bulls couple of weeks ago and are attacking with width and playing with confidence." Wing Maitland shared Blackadder's assessment. "We've trained really well, we had a good blowout, the bodies are refreshed and mentally we are there," he told Reuters. "We like to spread the ball around and, even though we'll look to mix it up, we're going to do what we do well, which is spread it a bit. We'll take the same mentality from the last couple of weeks in terms of our gameplan." The Bulls had beaten the Crusaders in two consecutive semi-finals but Blackadder dismissed that statistic. "They had the wood on us last year but we come here with confidence and take a lot out of the game two weeks ago." The Bulls-Crusaders semi-final will be the first major rugby fixture staged in the black township of Soweto, about a 30-minute drive southwest from Johannesburg, the South African financial centre. The move from the intimidating Loftus Versfeld in an upmarket Pretoria suburb to Orlando Stadium was necessitated by preparations at the rugby ground for the upcoming soccer World Cup.